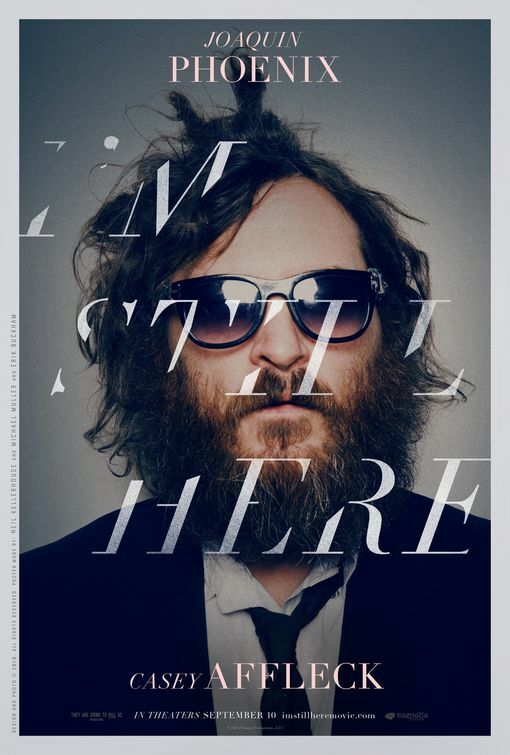 By the time I got around to seeing “I’m Still Here”, I didn’t have to wonder whether or not the film was real. Not too long after the release of this mockumentary focusing on actor Joaquin Phoenix’s retirement, career detour, and downward spiral, his brother-in-law/director Casey Affleck announced (apparently at the behest of Magnolia Pictures) that it was all a hoax. That came as no surprise to me, seeing as how I didn’t buy into any of it to begin with. 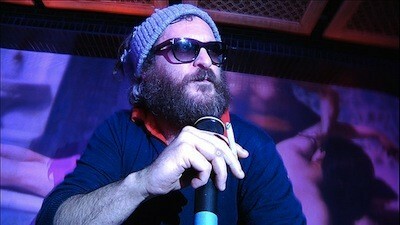 In late 2008, when Joaquin Phoenix made the announcement that he was retiring from acting and that “Two Lovers” would be his final film, not only did I not believe it but I didn’t care. There were rumblings online about how he was going to focus on his music and then it was reported in early 2009 that he had his first gig in Vegas. Then word spread that Affleck could be found in tow with a film crew, following an unkept, scraggily-bearded Phoenix and his new hip-hop career path. A small percentage saw his rap skills in person, while the whole world watched wherever footage was posted. No one took him seriously and, unsurprisingly, the media had a blast. Then there was Phoenix’s now-famous appearance on David Letterman in early 2009, which was likely the world’s first exposure to his unkept mess. A bearded and seemingly incoherent Phoenix claimed before his suspicious and perturbed host that the movie he was promoting, the predominately well-received “Two Lovers”, would be his last film. I remember seeing that show and being as annoyed and mystified as most were. Since I now know it was all an act, maybe that appearance was a success and he did what he set out to do. Regardless, Phoenix fell flat for me and did nothing to warrant any interest in him. After all, he’s no Andy Kaufman. “I’m Still Here” is supposed to document the events in between all those snippets from “Entertainment Tonight” and flesh out “the real story” behind all those internet rumors. It’s supposed to show us some kind of inner turmoil and personal trauma that the aspiring rapper went through. Throughout the film, a bloated, chain-smoking Phoenix is often seen whining about how distraught he is about life, as his entourage surround him, follow him, and enable him. He’s shown snorting coke off a prostitute’s breasts, someone he hired online (Affleck admits that was staged. Uh huh.). We also see him hounding P. Diddy for a record deal, puking after a failed Miami nightclub gig, and we’re shown “his friend” defecating on Phoenix’s face while he’s sleeping. Phoenix is pretty much awful and ungrateful to anyone around him and comes across as genuinely miserable. We even see him get worked up over what people say about him online. He spends what seems like hours reading what people write about him and watching parodies of his current persona. He gets irate and blames everyone but himself. In a ridiculous tirade, he even states that “Revolutionary Road” received all the accolades that his “Reservation Road” should have. Um, really? Wow. How are we supposed to feel anything for someone who comes across as such a narcissist? What’s worse than witnessing all this, is that no one really seems to care. Not his friends, his brother-in-law, and especially not me. So, let’s say this downward spiral/pre-midlife crisis was real, then the fact that no one shows any real concern for this guy is sadder than what we see on film. Who knows, maybe there were others who showed alarm at Phoenix’s behavior, but it didn’t make the final cut since Affleck’s goal here was….well, I don’t know what it was. Whether or not this is fact or fiction, documentary or mockumentary, will be debated ad nauseum for some time. Does Affleck give any tells? Maybe. In the beginning of the film, he shows us old clips of the entire Phoenix clan dancing and singing for an audience. Then, we later see Phoenix making an appearance on a talk-show promoting “Walk the Line” where he states he’s never had any musical experience. Framed as such, we could believe that there is a set-up to prove he is clearly a liar or it could be a red herring to plant our suspicion from the get-go. Some may say that this erratic and hostile performance of Phoenix’s only solidifies what a great actor he is. The best acting out of the film comes from Edward James Olmos and Sean Combs. Imagine that! I already knew that Phoenix had talent, so I didn’t need to be submitted to such an uncomfortable showcase. If the goal here was to simply discomfort, it has succeeded. It’s reported that both Phoenix and Affleck set out to make some kind of statement on how we view celebrity and what we accept as reality, or something like that. But, ultimately, the whole thing winds up being a completely unconvincing and unnecessary exercise in nothing. I remember all that stuff about Pheoenix losing it, and like you, I couldn’t seem to bring myself to care much. I do remember the first time I heard rumors that it was a hoax, and really, that seemed to make a lot more sense, so after that I started looking at the ‘news’ differently, and it really seemed obvious after that. Of course, I think I only saw a few snips and pieces anyway, since I don’t have cable. At any rate, when the big announcement came, I wasn’t surprised. Seems to me that announcing it as a hoax so early kind of defeats any aim toward ‘proving’ something. I think the funniest part of the whole thing was Letterman’s part in the whole thing. Knowing now that he actively participated perpetuating the thing, makes his reaction that much better. Because I think that might have been the only ‘suprise’ about this whole thing! wow, that was badly written. I haven’t had my coffee yet, and I don’t think any part of that made any sense. I really should have read it before posting. Ugh. While that Letterman appearance was stellar, I always had this idea that if the film was panned and didn’t make it big they could have just said it was all a big joke and they were not serious from the start. Like a get out of jail card.